Positivi-Tea is our strongest THC blend with a 2:1 ratio THC and CBD. This formula can provide relief from feelings of anxiety and stress and bring on more joy and laughter. The dominant peppermint taste beautifully masks the cannabis taste. 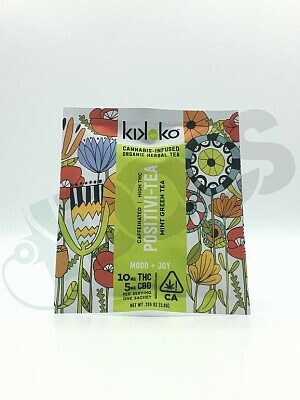 Organic ingredients: peppermint, green tea, spearmint, licorice root, lemon myrtle, lemongrass, safflower petals, and Kikogold cannabis active. Avaliable in individual pouches as well!